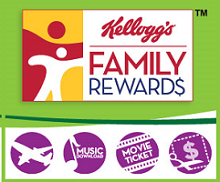 For those of you who are collecting the Kelloggs Family Rewards Codes, there is a new one available and this one is worth 25 points. I love getting these codes and have recently connected my store loyalty card so all my points from Kelloggs products I buy are automatically added to my account! YAY! No more trying to decipher codes from the inside of packages. :)) Anyway, here is the new code, expiration is unknown.